Tonight at the Tribeca Film Festival, Robert De Niro, Martin Scorsese, Jodie Foster, Cybill Shepherd, and writer Paul Schrader will take the stage for a discussion and screening to fete the 40th anniversary of ‘Taxi Driver’. These many decades later, the movie hasn’t waned an ounce in relevance. The face of New York has changed immeasurably, sure; antihero Travis Bickle would be hard-pressed to recognize the landscape of a sanitized, post-Giuliani Times Square. (That rain that Bickle prophesized would “come and wash all this scum off the streets” turned out to be more of a deluge of Disneyfication.) But we’re still smitten with violence in all its many forms, and now more than ever, we’re a culture as obsessed with self-mythologizing as Bickle himself. On the runways, too, Scorsese’s masterwork—by this writer’s estimation, at least—has long resonated. Lee McQueen’s Fall 1993 collection, his first after graduating from Central Saint Martins, took the film’s title as its name, and paid homage to it in typically unflinching form, with prints of Bickle and blood-smeared models; McQueen’s own father was a taxi driver. (For more on the collection, which was never fully photographed, visit this excellent and encyclopedic Tumblr dedicated to the house.) For Junya Watanabe, who conjured up Bickle on his Fall 2006menswear runway, De Niro’s character was emblematic of strength and single-minded motivation. 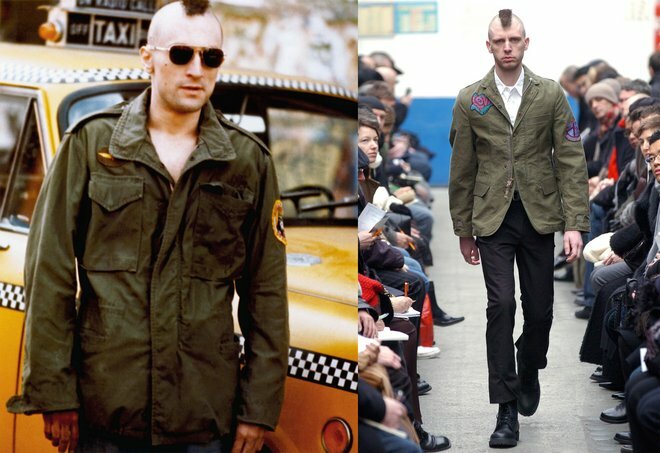 “Men,” Watanabe mused backstage, “should take charge.”Taxi Driver, of course, is more than Bickle. Jodie Foster was just 14 when she was nominated for an Oscar for her turn as Iris Steensma, the teenage runaway and prostitute who Bickle is so hell-bent on saving. 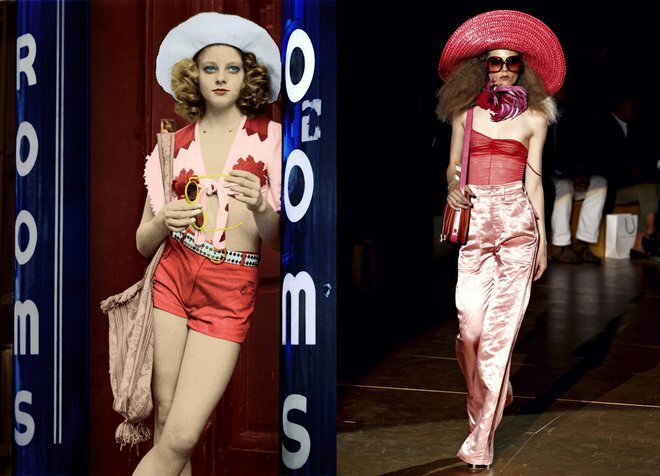 There was a whole lot of Iris in the hot pants, platforms, dinner plate–sized sunglasses, and wide-brimmed sun hats that Marc Jacobs sent down the catwalk for Spring 2011, albeit stripped of the character’s childlike vulnerability, a high-gloss glamour in its place. 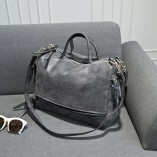 More recently, Stuart Vevers offered up a quiet homage to the character with Coach 1941’s latest collection; subtle ’70s-inflected touches are right in step with fashion’s current yen for all things to do with that decade.